Rick Remender is a man who can seemingly find time to churn out series after series. That's a good thing, because he has a knack for creating worlds that are truly science fiction and rife with interesting characters and events. Teaming up with Sean Murphy and Matt Hollingsworth on Tokyo Ghost is no exception and now Image Comics is poised to release the first five issues in a trade paperback this March called Tokyo Ghost, Volume 1: Atomic Garden. On the isles of New Los Angeles, 2189. Humanity has become nothing more than a sea of consumers: ravenous and starving wolves, sick from toxic contamination, who have to borrow, beg, and steal for the funds to buy, buy, buy their next digital fix. Getting a thrill, a distraction from reality, is the only thing left to live for. Entertainment is the biggest industry—the drug everyone needs—and gangsters run it all. And who do these gangsters turn to when they need the "law" enforced? Led Dent and Debbie Decay, constables of the law, which is a nice way to say “brutal killing machines." The duo are about to be presented with an assignment that will force them out of the decay of LA and into the mysterious lost nation of Tokyo. 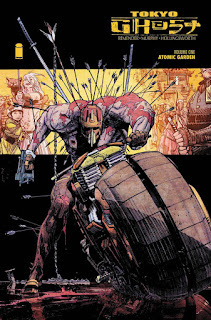 Tokyo Ghost, Volume 1: Atomic Garden (ISBN 978-1-63215-663-1) hits comic book stores on Wednesday, March 9th and bookstores on Tuesday, March 15th, and will be available for $9.99. It can be ordered by retailers from Diamond Book Distributors with Diamond code JAN160652. Full press release below.